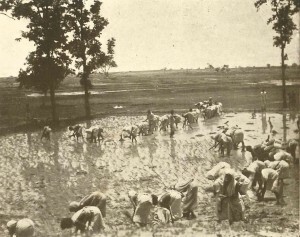 People working in the fields at Purulia Leprosy Home, West Bengal, India. The flows of immigration that took place from the sixteenth century onwards involving trade and the transportation of people inadvertently transmitted leprosy from the New World to the Old World. This includes the voyages of exploration in search of spices or goods for trade, such as the voyages of the Portuguese to Goa, Brazil, Macau, Angola, Mozambique, Madagascar, and Mauritius; the seventeenth century slave trade from Africa to Portugal, to the West Indies, Guiana, and Brazil, and the nineteenth century immigration of indentured labourers such as the Chinese to Hawaii, Malaya, Canada, USA, Australia, West Indies, and Indians to the Pacific islands – all would have transmitted leprosy. A great deal of energy went into balancing the costs associated with the creation of leprosaria and determining the sort of character they should have. All of these reckonings arrived at compromises that were dictated by economic imperatives. These reckonings also included a calculation that depended upon the labour of people who were confined in leprosaria. This calculation was bolstered by the moral imperative to put people to work. People in leprosaria the world over were required to build their own shelters and to grow their own food. Leprosaria that were self-sufficient mitigated the drain on the public purse. Leprosy determined how people with the disease could labour. Leprosy also differentiated on the basis of social standing and ethnicity. Leprosy robbed people of their social and their economic status, but the wealthy were often permitted to stay at home instead of entering an asylum, while those who had no resources had no choice but to surrender their liberty. Immigrant labourers were especially targeted for the presence of the disease. For example, the Chinese and Polynesians and Melanesians underwent regular physical examination for leprosy in the colony of Queensland. League of Nations Health Organisation, Report on the Study Tour of the Secretary of the Leprosy Commission in Europe, South America and the Far East, January 1929-June 1930, Geneva 1930.